Chronically reduced myocyte contractility is becoming endemic in the ageing populations of developed countries. Important contributing factors are loss of sarcomeres, or an impairment of their functions including their signalling roles. SARCOSI currently brings together 12 research teams that together perform research on “Sarcomeric Signalling”. Recent research progress highlights an important role of sarcomeres not only as a contractile unit, but also by their function as signal integrators. 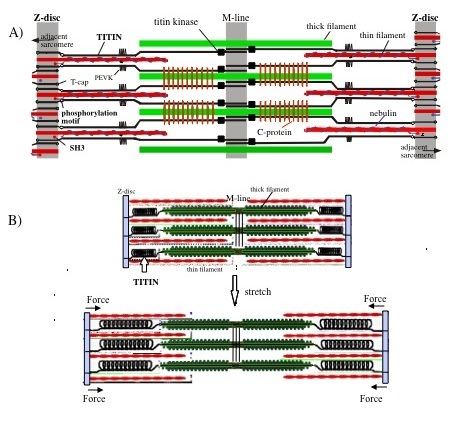 Research on sarcomeric signalling focuses on particular on the giant titin and nebulin proteins that constitute half-sarcomere (titin) or thin filament(nebulin) spanning filamentous structures in vertebrate myofibrils (Figure 1). Within SarcoSi, he clinical teams study how muscular diseases affect the myofibrillar signalling. This research is complemented by basic scientists that address how the titin and nebulin filaments mediate muscle remodelling and control of muscle maintenance in healthy muscle. Taken together, our joint research covers basic research from single molecules to studies of the biomechanics of intact hearts and skeletal myofibrils. Our joint mission is to apply this knowledge towards the design of therapeutic interventions. Fig. 1. Layout of titin and nebulin filaments within sarcomeres. Single titin polypeptide chains spans from Z-disks to M-lines, whereas nebulin co-extends with thin filaments. Spring elements in the I-band region of titin confer elastic properties to its filament system and allow it to mediate stretch-dependent signal pathways, involving also a serine-threonine kinase domain close to the M-line. Nebulin controls calcium-sensitivity of the thin filament and also structurally stabilizes it. Novel data from team#15 indicate that nebulin participates in myofibrillogenesis control. News with the title "Leducq Meeting" have been uploaded. News with the title "Transatlantic Network of Excellence" have been uploaded. News with the title "New SarcoSi Homepage" have been uploaded. News with the title "PHD made by SarcoSi" have been uploaded.